This medical malpractice staph infection claim was filed in Howard County after a blood infusion caused a man's shoulder to become infected. It was filed in Health Claims Arbitration on March 28, 2018, and it is the 147th medical malpractice case filed in Maryland this year. In spite of the plan to perform an autologous blood injection, the doctor initially injected the man's shoulder with Kenalog, a corticosteroid used to reduce inflammation. The man had to remind the doctor that he was there for an autologous injection. A nurse drew blood from the man's arm without properly preparing his skin, and then handed the syringe to the doctor who injected the blood back into the man's opposite shoulder. The pain in the man's shoulder continued and worsened after the injection. The man called his doctors five days later, complaining of pain so severe that it prevented him from putting on a shirt. The doctor ordered an MRI of the man's right shoulder. By the time the man arrived for his MRI, he could not tolerate the pain and was running a fever. The MRI confirmed his diagnosis of septic arthritis at his shoulder joint. He was scheduled for surgery the same day, and a surgeon washed a significant amount of purulent material out of his shoulder. Pathology later used cultures from the surgery to identify the infection as Methicillin-Sensitive Staph Aureus. Autologous blood (ABT) is a type of blood transfusion that reinfuses the same person with their own blood. Patients undergoing elective surgery can plan to have their blood drawn long enough before their scheduled surgery so their bodies can recuperate. 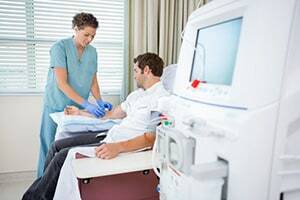 ABT may be preferable for patients who are concerned about immunosuppression or infection from donor blood. Staph is a commonly in our nose and throat. type of bacteria frequently present on healthy peoples' skin or in their noses or throats. This non-infective bacteria is called colonization. Most of us who are colonized have no ill side effects. The problem arsies when staph is resistant to some antibiotics. Staph resistant to methicillin and other "beta-lactam" antibiotics is called methicillin-resistant staphylococcus aureus (MRSA), which is different from it from methicillin-sensitive staph (MSSA). In this situation, there is now a very aggressive bacterium in the bloodstream that is circulating throughout the body. Most staph infections arise from exposure within a matter of hours or days. But if it is a chronic infection, it can be months or even years before the infection rears its head with symptoms. Drs. Collins, Brill and Twigg, P.C. Failing to employ adequate diagnostic procedures and tests. Failure to carefully and timely diagnose the claimant's condition. Failing to perform the appropriate treatments and make appropriate surgical referrals to correct the claimant's condition. Failing to ensure a sterile operating filed with sterile instruments and medications. Failing to supervise the sterilization of surgical instruments and/or techniques. Failing to avoid contamination when performing an autologous injection. As a direct result of the defendants' medical negligence, the claimant suffered physical disability and debilitation, emotional distress, and unnecessary expenses. View sample medical malpractice verdicts and settlements from Howard County. Read more about infection in Maryland malpractice lawsuits.